The run will take you across fells, moorland and fields, and although mostly on good tracks, it may be very wet and boggy in places – please come prepared for the terrain and possible adverse weather conditions, with trail shoes (or old trainers), plenty of layers and a waterproof. Don’t forget to bring some baubles and tinsel, and as always, festive hats are a must! As per previous years John Hopps has once again took on the challenge of arranging the bus to Loftus, not only this but he has booked the Waterwheel Inn pub for afterwards where hot food and refreshments will also be available. This has always been a popular race with the Bounders, fancy dress, as you can see above, is optional. The Loftus Bus will be leaving Ponds Court Consett 8.30am & leaving Loftus for lunch at the Waterwheel Inn Liverton 1.00pm, departing at 5.00pm for Consett. 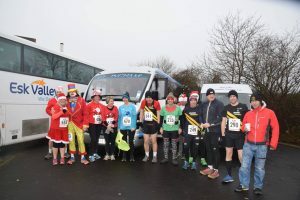 The run is approximately 8 miles and covers country lanes, bridleways, footpaths and muddy farmer’s fields. The course is generally ascending for the first half of the race, with a steep climb at approximately half-way to the Boulby mast. It is then an exhilarating downhill run down to the finish where a mince pie and glass of wine awaits you! Sturdy trainers or trail shoes are recommended – there is too much road to suggest fell shoes, unless of course we get some heavy snow! With costumes and lots of cameraderie the Poultry Run is a great way to get your festive holiday off to a flying start. And who knows, with some generous prizes of Christmas fare – including the eponymous poultry – it could also be a handy way to stock your larder! Have you got your ticket yet? No? Well you’d better get it quick! 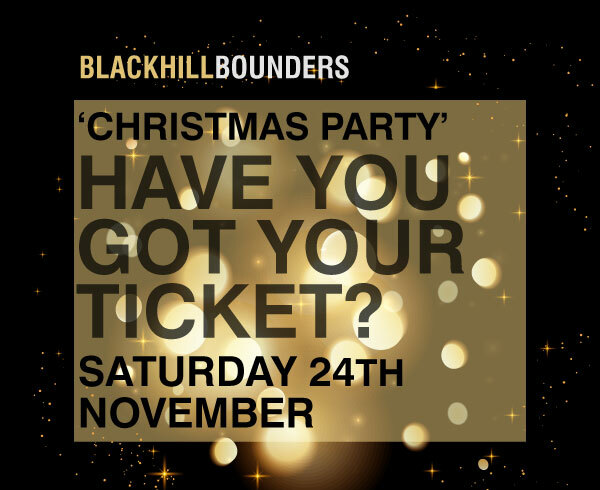 You could win a year’s membership to Blackhill Bounders – just one of the fab raffle prizes we have! Oh, and there’s live music from Tiny Afro and funk/soul/disco by DJ Stephen Collins. Partners and ‘plus one’s’ welcome! 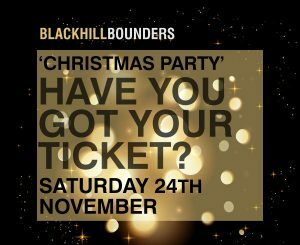 Comment on the Blackhill Bounders Facebook post saying how many tickets you would like, or email vicki@glazing-films.co.uk Please pay into the BB bank account and mark your payment as ‘Christmas Party’ on your payment .